NEW ORLEANS – Consider it the calm before the storm in the NCAA and NJCAA Cross Country seasons. With the postseason about three weeks away, we’ll see a number of Pre-National Invitationals and other big meets this weekend. That meant this past weekend was a little bit light, but that doesn’t mean slow. 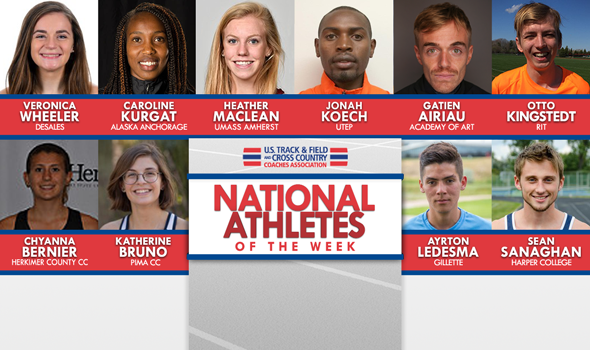 Here are those 10 men and women named NCAA and NJCAA National Athletes of the Week by the U.S. Track & Field and Cross Country Coaches Association (USTFCCCA) on Monday. If UTEP’s Jonah Koech runs like he did this past weekend, he’ll get back to his freshman form in no time. Koech won the New Mexico State-UTEP dual meet this past weekend by four seconds over teammate Cornelius Kapel. He covered the 4.01K tract in 11:46.2. Just a few years ago, Koech finished 11th overall at the NCAA Division I Cross Country Championships. Koech was a freshman then and for the Miners to make some noise in the stacked Mountain Region, he’ll need to be at the same fitness level again once the postseason hits. Heather MacLean got back to her winning ways this past weekend. MacLean captured the individual crown at the NEICAAA Championships. She covered the 5K tract in 17:36.1, 19 seconds ahead of the runner-up. This was MacLean’s second win of the season. MacLean is hoping to make her first trip to the NCAA Division I Cross Country Championships. Gatien Airiau had himself a weekend. The native of Sassenage, France won the Lewis Conference Cross-Over with a time of 24:42.8, defeating 348 runners from a slew of top-notch NCAA Division II program. The graduate student crossed the finish line six seconds ahead of his closest competitor. Airiau was up against runners from eight nationally-ranked teams, yet picked up his second victory on the season after also winning the NDNU Argonaut Invitational on Sept. 2. Caroline Kurgat is no stranger to this weekly honor. The senior from Alaska Anchorage put together one of her finest performances this past weekend at the Lewis Conference Cross-Over, winning the meet with a time of 21:18.9. The native of Kenya defeated her nearest competitor by a whopping 12 seconds while helping propel her squad to a third-place finish. In a race that featured 359 runners, including athletes from eight nationally-ranked schools, Kurgat proved why she should pick up this honor once again. Otto Kingstedt asserted himself this past weekend at the Highlander Invitational. Running on the same course that he will in about one month for the NCAA Division III Atlantic Regional, Kingstedt outlasted 186 other competitors on his way to the individual title. Kingstedt covered the 8K tract in 24:46.6 and beat the runner-up by more than 18 seconds. According to TFRRS, this was Kingstedt’s second race since he finished eighth in the 10,000 at the NCAA DIII Outdoor Championships in May. He also won his first meet of this season. Veronica Wheeler rose to the level of her competition this past weekend. Running at the DeSales Invitational with a number of NCAA Division II and NCAA Division III athletes, Wheeler cruised to a 29-second victory. Wheeler topped 224 other runners in the process. Last year Wheeler finished 41st at the NCAA Division III Cross Country Championships. Performances like the one we saw this past weekend give us reason to believe she’ll improve upon that come November 18. Ayrton Ledesma finished third at the 8th Annual Roadrunner Invitational behind an unattached competitor and an NCAA Division II runner. The product out of Oregon was neck and neck with the two aforementioned athletes until a strong push in the last 20 meters by the first and second place finishers. However, Ledesma’s time of 25:56.3 was the fastest by an NJCAA Division I athlete at the race, and he bested 68 runners, including a plethora of NCAA Division II competitors. Katherine Bruno turned in a solid weekend for Pima CC at the Mesa Thunderbird Classic, where she finished second with a time of 18:43.1. The native of Tucson, Arizona finished just four seconds behind an NCAA Division I runner from Grand Canyon and 19 seconds ahead of the third-place finisher. The runner-up finish marked the best finish for Bruno during her young career. Sean Sanaghan won the Eagle Invitational at Benedictine University this past weekend, besting a field of 175 runners. The freshman posted a time of 26:10.6, good for four seconds ahead of a runner from NCAA Division III nationally-ranked North Central (Ill.). A majority of the competitors in the field hailed from that level, yet Sanaghan and his squad finished second thanks in large part to his performance. Chyanna Bernier placed third at the highly competitive Hamilton Invitational this past weekend in a race that featured 85 runners that mostly hailed from the NCAA Division II and NCAA Division III levels. The sophomore posted a time of 19:05.2, finishing behind just two runners from NCAA Division III Hamilton.